Much has been written and will continue to be written about the internationally famous Greenock sculptor George Wyllie (1921-2012), but here is another 'stone to the cairn'. When I read, in March this year, of the celebratory exhibition, 'George Wyllie: A Life Less Ordinary', which ran at the Collins Gallery, University of Strathclyde, until 21 April, it seemed to me appropriate to remind Campbeltonians of their own little WylIie sculpture at the head of the New Quay. Now that the man himself is gone, the reminder seems a1\ the more relevant; but Wyllie's Campbeltown connections extend beyond the 'Ro-Ro'. First, however, to the sculpture itself. The 'Ro-Ro' (Ro1\ on-Roll oft) project was initiated in 1996 to celebrate the restoration of the historic ferry-link between Kintyre and County Antrim. The then Conservative Secretary of State for Scotland, Michael Forsyth, spurned CalMac in favour of Sea Containers (Scotland), which set up a subsidiary company, the Argyll and Antrim Steam Packet Co, to run the service. In 1997, at Forsyth's insistence, CalMac handed over its vessel the Claymore for the new company to operate on the service. Disgracefully, the so-called 'Steam Packet' ran out of steam almost from the first, pulled out after three years and then sold the Claymore. Wyllie's 'Ro-Ro' has for twelve years been a memorial to the service it was created to celebrate. The project was initiated by the Art Department of Campbeltown Grammar School, whose head, Ronald Togneri, was given early retirement in 1996, after the funding - from the Scottish Arts Council, Argyll and Bute Council and Campbeltown Common Good Fund - had been secured. His successor as head of the department, the late Cathy Kerr, chose George Wyllie to lead the project. Wyllie visited the Grammar School twice, the first time to discuss the project with staff and pupils, and the second time - a two-day stint in April 1996 - to work in the Art Department. As Cathy Kerr recalled: 'Everyone found him easy to respond to. He seemed younger and quicker than we expected.' More than a hundred sculptures on the theme of Scottish-Irish links were created in a wide range of materials. George Wyllie's own model, created from plywood and wire, was inspired by a combination of Saint Columba's skin-hulled curach, the medieval Scottish birlinn, or longship, and his personal love of boats. Wyllie's sculpture was made up in steel and aluminium by workers at Campbeltown Shipyard, mounted on a stone plinth at the head of the New Quay by the ferry terminal contractors, Edmund Nuttal Ltd., and unveiled on 7 October 1998 by two Grammar School pupils, Collette Sloey and Alan Downie. The ceremony was well attended, by pupils, Argyll and Bute and CampbeItown Community councillors, and townsfolk and visitors, including two Canadian cyclists. Wyllie himself was there and complimented the school and community for working so well together. He also talked about boats as a great passion in his life and suggested that Saint Columba had established the first ferry service from Antrim to Kintyre, a rather fanciful notion - as, indeed, he may have intended it to be - since sea-links across the North Channel existed from pre-history, and the tradition of Columba's landing at Southend, during the voyage into exile which took him to lona, is tenuous. By a happy coincidence, Wyllie's preferred location for the sculpture was also the ferry terminal. The plaque on the plinth reads: This sculpture by George Wyllie was created as part of a project in the Art Department of Campbeltown Grammar School in 1996 with support from the Arts Council, Argyll and Bute Council, Campbeltown Shipyard Ltd. and Edmund Nuttal Ltd.' Wyllie was paid £300 in 1997 for 'all services' - workshops, site visits, correspondence, etc - and travel expenses, a bargain indeed. His 'wee boat' has so far escaped the attentions of vandals and itinerant scrap-metal thieves. Other Wyllie sculptures have found homes in Kintyre. On permanent display in Campbeltown Library is one of his seven little Vital Spark puffers which toured Argyll and Bute in 2001. Wyllie's friend Naomi Mitchison had three of his birds set up in the grounds of Carradale House; these were early versions of the one he constructed in East Berlin to look over the Wall which was pulled down in 1989. Professor Ronnie Roberts, Ardnacross, has a Wyllie steel sculpture titled 'Fish and Chips', which was bequeathed to him; and Wyllie was actually a colleague of his father's in the Customs service. What isn't widely known is that Wyllie had Kintyre blood-connections. His full name was George Ralston Wyllie, and, as his obituary in The Herald pointed out, 'for many years his family and friends called him Ralston' . His line can be traced back to Patrick or Peter Ralston (171295) and Helen Maxwell (d. 1793), and Kintyre families related to him include the Wallaces (West Drumlemble), Watsons (Muasdale), Johnstons (Oatfield), Mitchells (Aros) and, of course, but further back, the local Ralstons, which is the only family in the list still farming. Dougie Mitchell in Campbeltown remembers Wyllie visiting his Mitchell relations in Aros, which was, of course, the birthplace of another Scottish artist, William McTaggart. Sources: primarily, Cathy Kerr's file on the 'Ro-Ro' project, from John Kerr; letter I from Ronald Togneri, 6/6/2012; e-mail from Ronnie Roberts, 15/6/2012; genealogical information from John and James Wallace, Campbeltown; Campbeltown Courier, 23/10/1998, report of unveiling of 'Ro-Ro' sculpture; obituary of G. Wyllie by Jan Patience in The Herald, 17/5/2012; Caroline Corr, Campbeltown Library, bye-mail 6/10/2012; The Kingdom of MacBrayne, N. S. Robins and D. E. Meek, 2006, p 204. North Channel Corpse, 1869 DEAD BODY AT SEA. North Channel Corpse, 1869 page 19; BODY FOUND. SINGULAR FACT. Alex McMillan, fisherman, whilst cleaning a skate which he had caught on Friday, last week, found a shirt button and a silver threepenny piece in the stomach of the fish. Argyllshire Herald, 12/1/1867. Copyright belongs to the authors unless otherwise stated. The Kintyre Antiquarian & Natural History Society was founded in 1921 and exists to promote the history, archaeology and natural history of the peninsula. 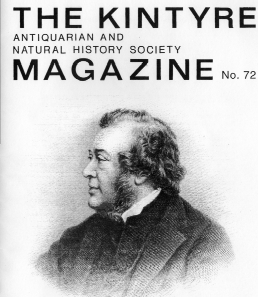 It organises monthly lectures in Campbeltown - from October to April, annually - and has published its journal, 'The Kintyre Magazine', twice a year since 1977, in addition to a range of books on diverse subjects relating to Kintyre. CLICK HERE for Correspondence and Subscription Information. Published with permission of The Kintyre Antiquarian & Natural History Society. 2015 Harold A. Ralston, Racine, Wisconsin, USA.